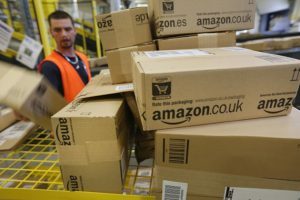 Amazon ranks high on a list charting Ohio's employers with the most workers and their family members on food stamps, with a new report estimating that more than 10 percent of its workforce in the state qualifies for the federal aid. The progressive policy group Policy Matters Ohio stated, as of August, Amazon had 1,430 workers and family members on food stamps, which helps low-income people purchase food. It ranks 19th on a list of 50 large employers in the state, according to the group. To be on the list, a company has to have a large number of workers in the state. In addition, that company has to have a significant number of workers who don’t make much money or maybe work part time. Workers getting food stamps in essence becomes an additional taxpayer subsidy for the companies that pay low wages, said Zach Schiller, Policy Matters’ research director. "We’ve appreciated having more employment, but maybe we should be focusing economic development dollars on good jobs. It’s pretty clear that a lot of these jobs are not good jobs," he said. "That should raise a policy question for our public officials, and that’s why we think its worth pointing out." According to the report, in order to be eligible for food stamps, a family of three could make no more than $26,208 a year, or about $12.60 an hour for someone working 40 hours a week. Amazon released a statement to the Washington Free Beacon about Amazon's paying practices. "Amazon full-time hourly employees in Ohio earn between $14.50 and $15 an hour as a starting wage with regular pay increases plus Amazon stock and performance based bonuses," spokeswoman Ashley Robinson said. "We also provide comprehensive benefits which include health, vision, and dental insurance coverage starting on day one, generous maternity and family leave, tuition for career education, and a network of support to succeed." The Ohio Development Services Agency released a statement praising Amazon for generating economic opportunity with its presence in Ohio that would not otherwise exist. "Amazon has created thousands of new jobs and generated millions of dollars in new payroll consistent with Ohio’s requirements for economic incentives," the Ohio Development Services Agency said. "These jobs provide economic opportunity to Ohioans that may not have had it before." Amazon has about 6,000 workers in the state, ranking 53rd on the list of the state's largest employers. The company's presence in Ohio will only increase, with Amazon planning to build two more distribution centers in the Buckeye State. Ohio has also put in a bid to be the home of Amazon's second headquarters, which The Dispatch reports would generate 50,000 jobs and $5 billion in investment. UPDATED Monday, 11:11 A.M.: This article was updated with a statement from Amazon.